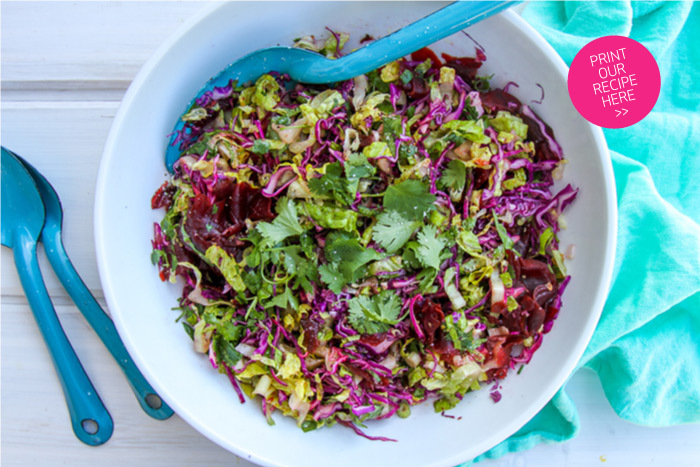 This beet and cabbage slaw is a refreshing side dish to pair with grilled pork. The zingy citrus dressing nicely complements the earthy beets and crunchy cabbage. 1. Whisk together the dressing ingredients in a small bowl. 2. Slice the beets and cabbage into very thin slices using a handheld mandoline or sharp knife and cutting board. Chop the lettuce and scallions and mince the cilantro. Toss the prepped vegetables together in a large bowl. 3. Drizzle the dressing over the vegetables at least 20 minutes prior to serving, (but no longer than 2 hours prior) to allow the flavors to fuse together. Keep refrigerated before serving.